Day four of this anniversary celebration-the ring may need polishing but the memory of this trip is still fresh. The winds here can sometimes rival those of the plains. They come unexpected and leave just as swiftly…. Ohhhhhh—klahoma where the wind comes sweeping cross the plain. Across Texas as well. 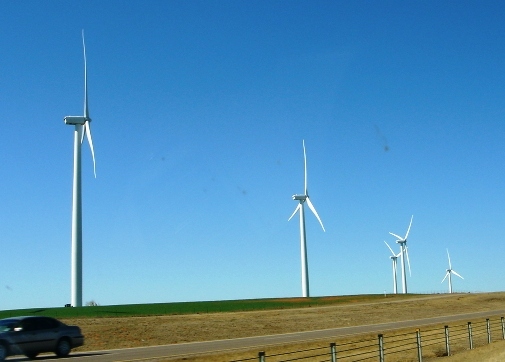 From the red clay earth of Oklahoma to the yellow/gray earth of Texas the winds were amazing. They were so strong that when I stopped at a rest area I had real trouble opening the car door. 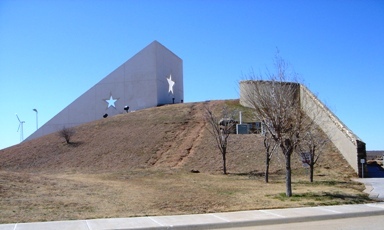 This rest stop is also a storm shelter. Notice that everything is bigger in Texas. There was quite a nice display of local history, information on wind farms in the area as well as barbeque shelters. How you could keep a fire going in these winds I have no idea. There was also a telescope for getting closer to the immense views. 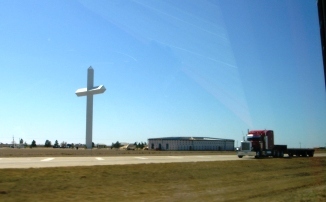 While driving I also saw the largest cross in the western hemisphere. That is is what the sign said at least. But since I saw an identical one yesterday I have my doubts. One long straight road today. My uncle called it miles and miles of nothing followed by miles and miles of nothing. Vast stretches of flat land dotted by isolated dark green bubbles or crumbly mesas rising up were my companions most of the day. It was almost dreamlike driving down the highway. I broke down and purchased a typical trinket at Meramac Cavern yesterday. 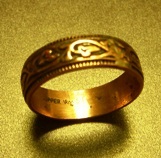 How do you like my new copper ring?